Come see our new floors! 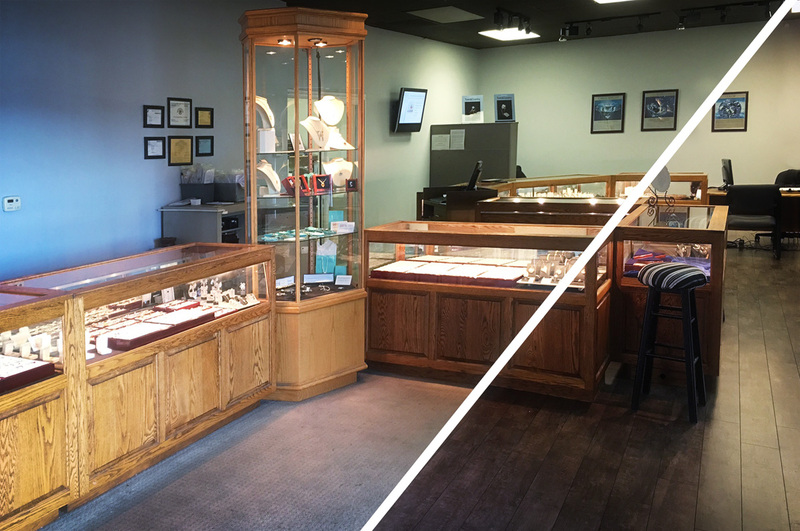 When we launched our diamond liquidation sale last September, we explained that it was time for a little showroom update. Today, we are happy to announce that the first part of our remodel has been completed! The old carpet served us well, but its time had come. With the help of a lot of friends and plenty of pizza, we emptied the entire showroom, had the new floors installed, and put it all back together again in one weekend. We would like to say a huge “thank you” to every one who generously set aside time in their weekend to help us. There’s still a lot more to come on our remodel, so stay tuned for more updates. In the mean time, why not come by and check out our new look? We’re always adding new pieces to our inventory, so if you haven’t been here in a while, you have to see some of the new additions. Plus, if you’re in the market for an engagement ring upgrade, loose diamond, or that perfect gift, why not take advantage of our free cruise offer (hurry though, it expires on April 15th)?